SandGate provides 2400 square feet of great family accommodation, with private front and back yards for playing and relaxing--and all this just 20 steps to a safe, sandy beach! 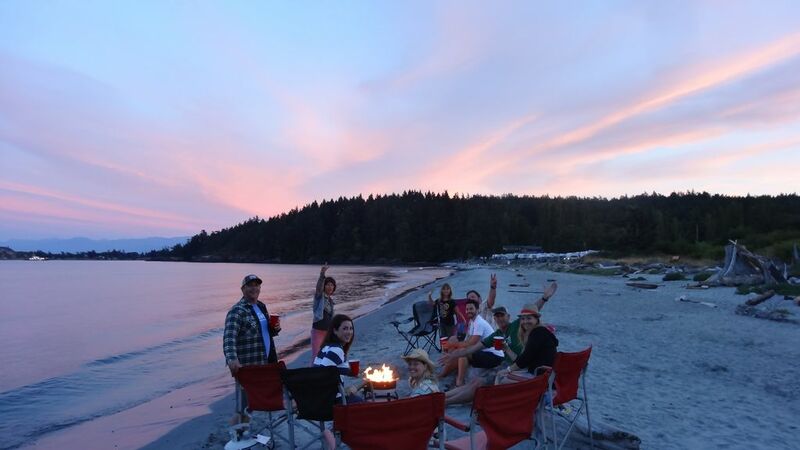 Children can play on the safe sand bar, where they can be easily supervised from the sun deck and the Hot-Tub for eight, overlooking this spectacular beach with extraordinary views of the Pacific Ocean, the Olympic Mountains, Mount Baker, and Victoria, British Columbia. Wildlife abounds including whales, seals, otters, and an incredible array of birds including, bald eagles, hawks, blue herons, and humming birds. Watch cruise ships and giant ocean-liners as they quietly make their way to Alaska, the Orient, and other world destinations. Sunrises are spectacular and the home is bright and sunny all day long. Features include: Queen-size bed in the master suite, a queen bed in the second,third and forth bedrooms, along with two single beds in the loft. A fully-equipped kitchen, the dining and living room and computer area all have great water views. The living room area includes a propane fireplace and a 47 inch high definition TV and entertainment system (DVD/VHS) with digital cable. The computer area includes a state of the art system with color printer and broadband Internet access. The lower level of the home includes a play area, a treadmill, nautilus weight system and pool table. A sunny back-yard patio overlooks a grassy and private play and garden area complete with a water view hammock made for two! SandGate is located in a quiet, tranquil country setting where you can purchase fresh farm vegetables and eggs just down the road and pick fresh blackberries right on the property. And it's ideal for visiting Victoria and other parts of Vancouver Island. Victoria is only a 30 minute easy drive, where you can visit the world famous Fairmont Empress Hotel, the Royal BC Museum, Beacon Hill Park, and numerous other tourist attractions. The Butchart Gardens is a 40-minute drive. Golfing (Spectacular Olympic View and The Royal Colwood Golf Courses are within a few minutes), diving, ocean (salmon, halibut, crabs) and lake fishing, sea kayaking, horseback riding, hiking and bike trails, tennis courts, wildlife sanctuaries, shopping, and the Casino are all nearby! The possibilities are endless! SandGate provides an oceanfront location and amenities that are simply fabulous for a wonderful family vacation, a quiet romantic get-away, or an unsurpassed retreat to just relax and do your thing! Visit SandGate once - and we know you will return - again and again! E-mail or call for additional information and pictures. We had a lovely time staying at Sand Gate house near Victoria! The house was beautiful, well stocked, and ready for us to arrive and feel like we were home! Thank you to our host, Paul! Home fit us really well for a multi-generational family vacation of 5 adults, 5 kids and 1 dog. Explore the island while coming back to the beach at your front door, with views all the way to Victoria and a jacuzzi on your porch. The host Paul was super helpful, meeting us upon arrival and giving us a personal tour of the house, including local tips on places to visit and eat. Loved how fully stocked it was from the kitchen to extra bedding. Just be aware that the loft space is best for older kids (say 8+), and even leaving it open with young (age 3) kids in the house made us nervous, so they ended up just sleeping on the pull-out couch and extra mattress in the basement. This is a beautiful home with lots of space and amazing beach! We enjoyed sitting on the deck sipping coffee and watching the waves! This place was incredible!! It has everything you could need and it is on the most beautiful beach. Perfect for families. We are definitely going to book here again! Paul was very nice and extremely accommodating. Perfect for our family reunion weekend! This beautiful home was the prefect place for our family reunion weekend. The house itself is spacious, clean and very well equipped with amazing ocean views and just steps from the beach. The host Paul, communicated very well throughout the booking process and welcomed us on our arrival with tips for the area, and a generous bottle of wine. The cottage worked very well for our family as the back yard was enclosed for the dog, and the beach was safe for our grandson. Paul has various games and activities in the shed which we used and enjoyed. The hot tub was a bonus with its spectacular views and we spent time on the deck watching the beach activity too. I fully recommend Paul’s place and would certainly return in the future. Special thanks to Paul for going out of his way to make us feel so welcome. A group of girlfriends and I stayed here for a 3 day getaway for my sisters 30th birthday. Everyone was raving about how beautiful Pauls property was! It was a perfect size for all 10 of us, there was more than enough space, with even a dining table big enough for all. The beds were very comfortable and the linens were so soft, a nice touch were robes in each closet! The kitchen was awesome, we cooked every meal in and had everything we needed. Sitting in the hot tub in the evening listening to the waves was of course a highlight. A big thanks to Paul for being a great host, we would happily come back in the future!